Years ago after my first experience living in Europe the mother of one of my friends called to see if I’d picked up a French accent in Switzerland! While that only occurs in very rare circumstances, one’s native language does undergo a transformation in a foreign environment. Actually, it doesn’t take long for words and phrases to slip into English. Proper names—streets, monuments, buildings—come flooding in right away, of course, but common words begin appearing as well. Sometimes the borrowed term is shorter and easier; sometimes it more accurately describes what you want to say. Like gare for train station, for example, and marché for that covered outdoor market not run by farmers that occurs once or twice a week. Because you don’t hear English all around you—on the streets, in stores, on radio and TV—and you’re not reading it all day long, you start losing your language. Already there have been times when we can’t come up with a specific word we want to use. Really humorous are new-fangled expressions we create that are a translation of French into English! I remember from our time as a family in Lyon one of our sons saying that he “had envy” of doing something; that is, he “felt like” it. Recently, too, both of us have been guilty of fracturing our vernacular. Like saying we are glad we “fell on this” where it would be better to say that we “happened (or came) upon” it. (Even as I write these words I feel a bit unsure if that’s really how we would phrase it.) Spelling, too, becomes an issue. I typed the word architecte into an English-language document the other day and wondered why spell-check didn’t like the letter e I’d put at the end of it! That being said, I’ve written before in my other blog about the deluge of English words French people use on a daily basis. 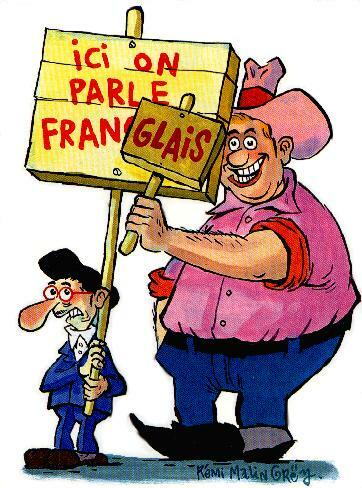 Now, you may be thinking that all that borrowing would make French easier to understand…but no. Because of the pronunciation à la française and the innovative usage, their franglais is at times more difficult to comprehend. Much of the chosen vocabulary, not surprisingly, has to do with modern technology. At the post office recently the employee told my husband that he had to flasher the barcode to determine the price. I’ve also heard flash-coder and don’t know if it’s the same or not. In order to get into certain buildings, you have to badger, which means to hold up a magnetic card to unlock the door. (How the heck do we say that?) 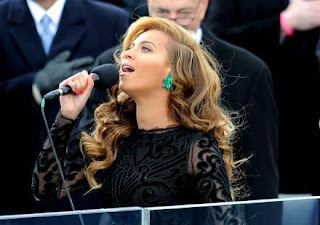 When Beyonce was accused of lip-syncing at the presidential inauguration, television reporters called it chanter en playback. A store in the neighborhood has a sign about repairs it makes on tablettes and smartphones. As for videos, it is possible to suivre en streaming. Not all terms are inspired by the world of technology, though. The right-wing Figaro newspaper the other day was gloating on its front page that a labor demonstration had been un flop. Many bars announce that they have a happy hour—which I’d love to hear pronounced. 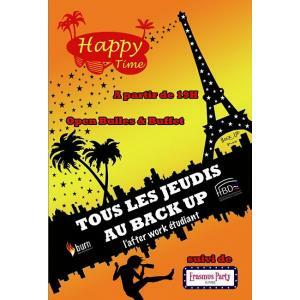 One bar across the street from us refers to it as happy time! Go there and have un cocktail! Add to the list words like blog, bulldozer, deadline, show, starting-block, among others. But I consider the 2013 winner to be the word buzz. On game shows like Harry and Slam (there you go again!) which I like to watch in the afternoon you have to buzzer before answering. When videos go viral, they are said to faire un sacré buzz. Likewise, really talked-about films are said to faire un énorme buzz. 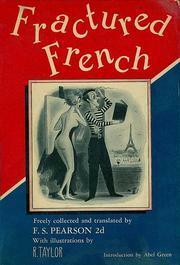 Members of the Académie française, that respected protector of the language of Molière, must be beside themselves.